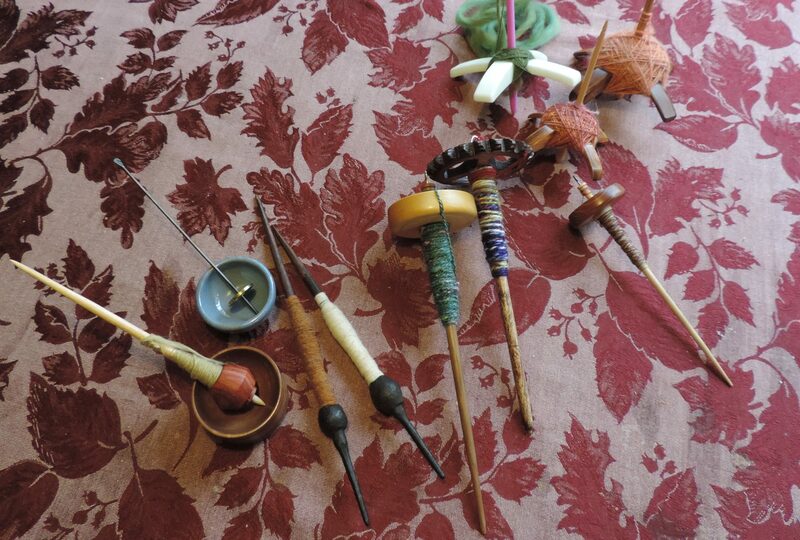 I attended a workshop in October 2013 about spinning cotton – on your wheels. It was great fun and I came away with a new passion and respect for cotton as a fibre. 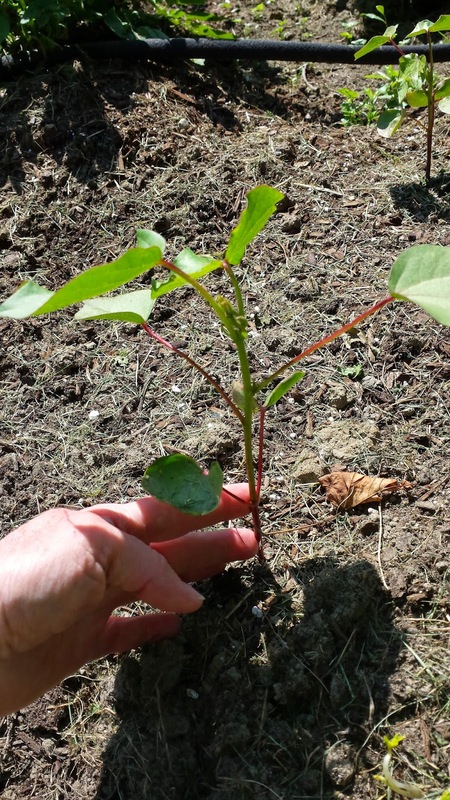 We were each given a couple of seeds of Heritage Bush Cotton in our workshop kits. I got a few more seeds from other participants for a total of 6 seeds. I planted then on May 20th and 5 came up. They grew nicely and in a short while I transplanted them to a sunny hot corner of the garden. They grew slowly and steadily — reaching about 24 – 30 inches in height. And then the magic happened. This thing that looks like a folded over leaf is actually the beginning of the blossom. See, when I gently fold back the greenery, inside is the beginning of a blossom. And here it is when it finally bloomed. What is sad is that it took so long to get to the blooming phase that there wasn’t time and heat for the rest of the process. 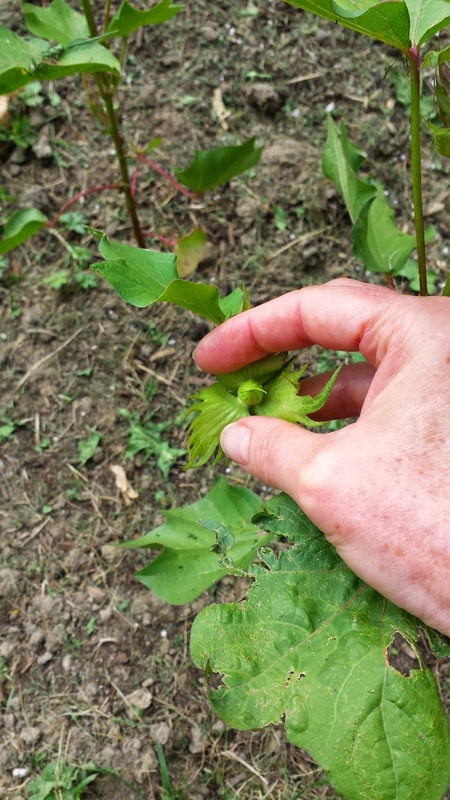 In the rest of the process, the flower gets pollinated, closes up and makes the cotton boll. That didn’t happen. What happened was the cold rains came. The plants valiantly flowered on, but the blossoms just folded up and rotted. A few weeks ago we had Arctic outflow winds for several days. 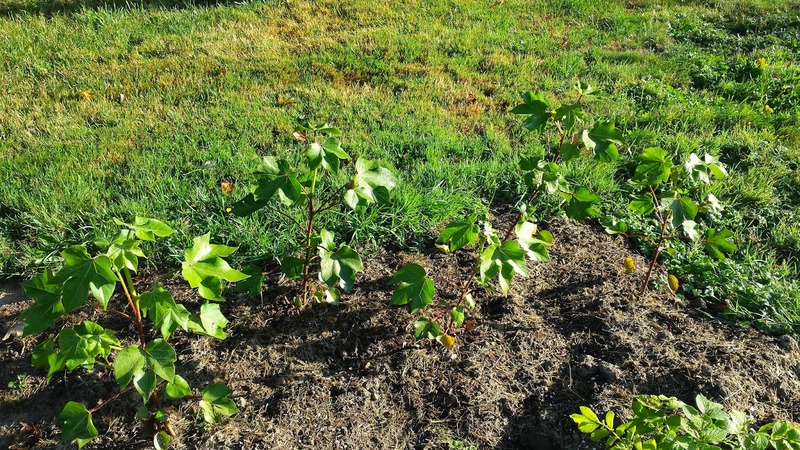 In fear that the cotton plants wouldn’t survive the sub-zeros nights and the windchill, I dug them up and brought them in the house. Where they promptly died or went into dramatic dormancy – I am eternally optimistic. I can’t show photos of that as it is far too upsetting. We’ll see what happens in the spring if they come back. In the meantime, I’m getting more seeds and I’ll plant them in February so they are well on their way by the time the summer heat comes. They really needed another couple of months, I’ll keep trying. 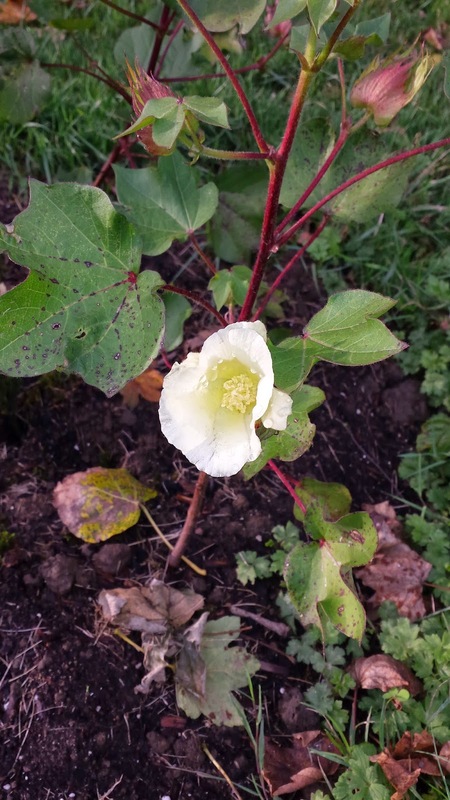 This entry was posted in growing cotton on November 30, 2014 by DianaTwiss. Here’s my latest project – this will go on behind the scenes for the duration of the summer. I hope it is a long, hot and dry one. No, I don’t. That’s too selfish. 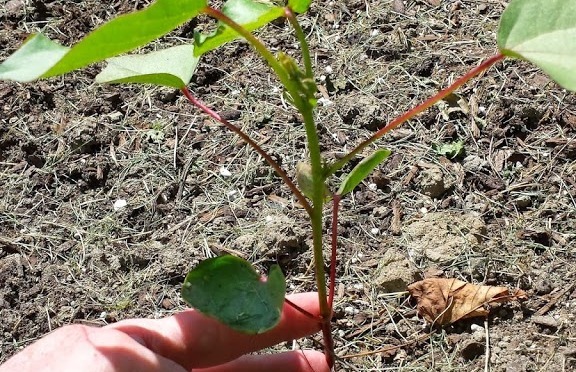 But that is what cotton plants need in order to grow and produce a flower, and thus the cotton boll. I’m inspired to try this out as the flax growing and processing over that last two summers was so satisfying. And I much prefer to spin cotton than flax, so this is worth the try. 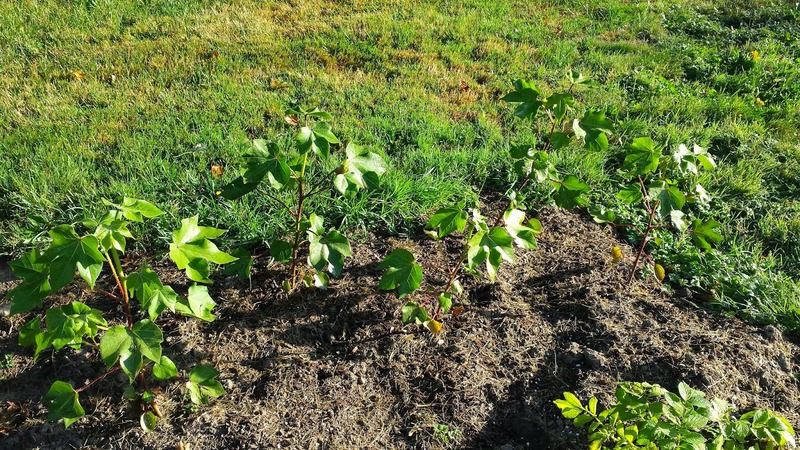 There were six pots of Heirloom Bush Cotton planted on May 20th. On June 4th, I had 50% germination. And four days later, two more came up. It has held at 5 out of 6 pots. That’s pretty good – 83% germination. Now I just wait for the heat to build and the lovelies to grow. I will transplant them into increasing larger pots as they grow. Don’t think I’ll actually put them into the ground in case I need to move them to a hot spot at the end of the summer. The original photos for this blog post were somehow lost. 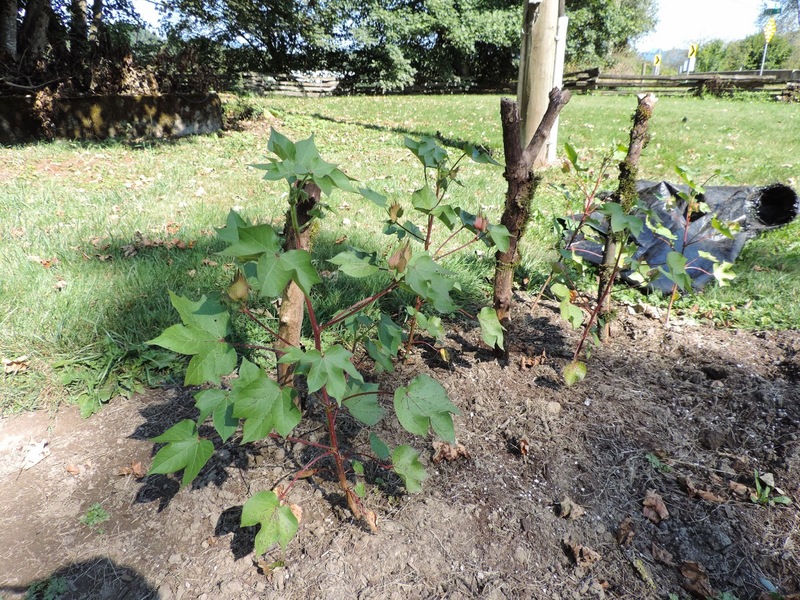 But here is photo of the plants a couple of months later, when I put them into the ground. Cutest plants. Hope they grow! 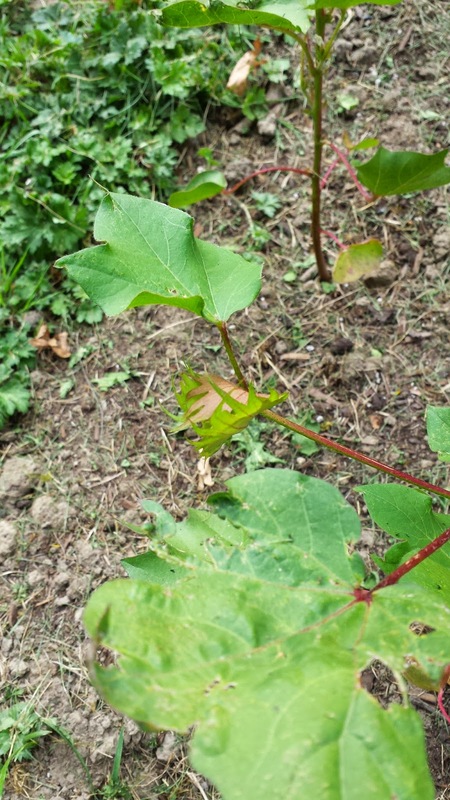 This entry was posted in growing cotton on June 17, 2014 by DianaTwiss.